Countess Elisabeth ‘Tisa’ von der Schulenburg - Flee - Vietnam, 1972 - Online gallery supplying original fine art. Trending Modern British and Contemporary Welsh. Available for sale from Big Sky Fine Art; this original painting by Tisa von der Schulenburg dated 1972. <br> The watercolour is presented and supplied in a sympathetic and contrasting contemporary frame to suit the subject colouration.<br> <br> The Countess Elizabeth “Tisa” von der Schulenburg was an extraordinary lady, who lived through extraordinary times, and through her art captured some of the most graphic suffering of the last century.<br> <br> She was born on 7th December 1903 into the Schulenburg family, a very old, very high Prussian clan, staunchly Nazi and truly aristocratic. Her father, Count Friedrich von der Schulenburg, was an army officer and her mother, Freda-Marie, nee von Arnim, came from another of Prussia’s old families. This background makes the choices Tisa made and the causes she championed even more remarkable, and her life is a cautionary tale about judging people.<br> <br> Elisabeth was the fifth child of the family and the only daughter. She became known affectionately as Tisa. The family had close ties to England, where her father had been posted as military attaché from 1902-1906. Although the family moved around frequently with various military postings, home was considered to be a castle within estates in Mecklenburg, northern Germany.<br> <br> The Great War had a profound effect on the family; Tisa’s father was appointed Chief of Staff to the Crown Prince and was involved with the key players at the highest level. The elder brothers saw action whilst still teenagers and returned home physically and emotionally scarred. By the end of the war the German Empire had collapsed, the monarchy had ended and power had effectively been transferred from the nobility to the bourgeois. For a family such as the von Schulenburgs, this hit very hard.<br> <br> Tisa Schulenburg had to some extent been protected from the outside world in her childhood, and her education had at first been through private tutors. As she grew up she started to break loose from the confines of her family; she attended boarding school on the Baltic coast, then spent a miserable year at home attempting to learn household management. What she wanted to be was an artist, but it was some time before her parents relented and she was allowed to attend the Berlin Art Academy. <br> <br> She studied sculpture under Fritz Klimsch and soon immersed herself in the whirligig of artistic, intellectual and social life of 1920s Berlin, where she became acquainted with such people as Thomas and Heinrich Mann, Bertolt Brecht and Oskar Kokoschka. In 1928 she married a Jewish businessman Fritz Hess, a match that caused huge consternation with her family, not only on account of his being Jewish, but also a divorce and twenty years her senior. When Hitler’s attained power in 1933 the freedoms and energy of the Berlin artistic world collapsed and Tisa left Germany, together with Fritz and many of their friends. She went to London in a move that signified a split with her family, as her father and four of her five brothers supported the Nazis.<br> <br> As Mr. and Mrs. Hess Tisa and her husband lived in Highgate, and moved in a circle that included the architect Ernst Freud, the father of Lucian and Clement. Tisa also struck up a friendship with Henry Moore and joined the anti-fascist Artists’ International Association. <br> <br> A chance encounter at the coast with a lady from Durham led to an invitation to give art lessons and talks to unemployed miners at Durham. Tisa obliged and later described that she considered she had found both a home and a job. This aristocratic German lady became an unlikely friend and champion of the gritty northern miners, and they developed a mutual admiration. <br> <br> Towards the end of the 1930s her marriage to Fritz broke down and they divorced in 1938. Later that year news reached her in Britain that her father was gravely ill and she returned home. Her father died in 1939 and Hitler attended the funeral. The British press obtained photographs of Hitler with members of the family, and when Tisa tried to return to England she was stopped by immigration officials at Croydon airport and prevented from entering the country. To the Nazis she was a socialist. To the British she was the daughter of a Nazi. She felt trapped and was obliged to spend the Second World War in Germany. She returned to Mecklenburg and in 1939 married a neighbor and former flame, Carl Ullrich von Barner. <br> <br> The story of Tisa’s fifth and favourite brother, Fritz-Dietlof, is remarkable in itself. Despite the political views of his father and brothers he turned his back on Nazism and worked with the Resistance. He was among the group of plotters who were intent on assassinating Hitler. The plot failed when on July 20 1944 a bomb planted by Colonel Claus Schnk von Stauffenburg – who had met with Fritz-Dietlof at Tis’a home – failed to kill Hitler. Fritz-Dietlof was among the first to be rounded up, and was later hanged as a traitor. <br> <br> Thus, by the end of the Second World War Tisa’s circumstances were extremely bleak. All of her family’s lands – which now fell in the Soviet zone of Germany – were expropriated, both her patents had died, her favourite brother had been executed and her other four brothers were also dead. It was a bleak and lonely time, and was followed, perhaps inevitably, by her divorce from Barner in 1946.<br> <br> Tisa worked for a while as a journalist and then for the British Army, before finding spiritual contentment as a convert to Roman Catholicism. In 1950 she entered the Ursuline convent at Dorsten, in the Ruhr, and took the name Sister Paula.<br> <br> She again struck up close ties with the local mining community and when the miners at Dorsten held a vigil in 1997 to protest about the proposed closure of the mine she joined in, at the coal face, and was a constant companion of and champion for the miners, even meeting with the Prime Minister on their behalf. <br> <br> Tisa combined her religious life with practicality, raising money to support her convent by selling her pictures. She also founded a Jewish museum, one of the first in Germany. Over the decades she became something of a local personality. She was made an honorary citizen of Dorsten, the first time that the award had been given to a woman. In 1994 she received the Federal Cross of Merit for lifetime achievement and for her strong social commitment – this was presented by the then Federal Minister for Women and Youth, one Angela Merkel. So far as her religious life allowed, she also returned often to England, staying with a niece in north Wales.<br> <br> Tisa had no children of her own, but was a much-loved aunt to several generations of nieces and nephews. Well into her nineties she retained her wit and unstuffy lightheartedness, and wonderment at life’s mysteries, among them the family bond. She died in Dorsten in 2001, aged 97.<br> <br> It has been said that Countess von der Schulenburg’s life became a metaphor for the post-war era-“They saw in her someone who had a deep understanding of what had happened in Germany, who represented the new Germany but came out of the old one, and who had managed through her independence and sense of freedom to make something good of herself”. <br> <br> Tisa saw human nature in all its complexities. She loved her family and was loyal to it, despite very real ideological differences, and the fact that the family denounced her brother Fritz as a traitor. She was tolerant and saw from the family’s failures that without forgiveness you make yourself blind.<br> <br> As an artist, Tisa demonstrated endless charisma and empathy; she was liberated, uncompromising and fearless and used her skills to a greater social good. Her sculpture and drawings reflect her experience and knowledge of the darker moments of the 20th century, with human suffering and hardship as a constant theme. She was one of the first German artists to recognise the plight of the Jews during the Third Reich and some of her most powerful work concerned the Holocaust, the horrors of which she addressed in a series of harrowing prints and bronze reliefs. She also sketched the refugees of Europe after the war, as well as the commemorating the sacrifices of the miners. It has been said that her drawings of miners turned them into demigods, and those of Jews turned ink stains into tears.<br> <br> Throughout her long life Tisa continued to draw the attention of the world to areas of suffering and oppression. She drew the civilians of Vietnam in the sixties, in an attempt to shock the security of those in the west and highlight the horrors of that Far Eastern theatre of carnage. She considered this war as particularly cruel in its inequality of arms, and the mass suffering of ordinary people. <br> <br> She has also completed works relating to conflict and social conditions in Africa and the Middle East, the starving in Biafra and Ethiopia, events in Chile, and social inequality in third world countries. Although towards the end of her life a vibrancy of colour appeared in her work, she was never able to leave the oppressed, the persecuted or the suffering and her images today serve as a reminder to us that we must not forget the consequences of what we do to each other.<br> <br> This extraordinary original work in ink and wash depicts two figures, a mother and child in a moment of panic and desperation. The mother hugs the young child to her hip with one arm. Her other arm is flung out as if leading the way or pushing through in an act of defiance. It is a strong pose, yet full of tenderness and human frailty. The madness of the situation is captured and reduced to its very basics – a fight for survival. <br> <br> There is very little detail in this artwork, but there is enough to tell us all we need to know. It speaks straight to the heart about the horror of war and its effects on people, with the bond between mother and child being preserved until the last. Available for sale from Big Sky Fine Art; this original painting by Tisa von der Schulenburg dated 1972. The watercolour is presented and supplied in a sympathetic and contrasting contemporary frame to suit the subject colouration. The Countess Elizabeth “Tisa” von der Schulenburg was an extraordinary lady, who lived through extraordinary times, and through her art captured some of the most graphic suffering of the last century. She was born on 7th December 1903 into the Schulenburg family, a very old, very high Prussian clan, staunchly Nazi and truly aristocratic. Her father, Count Friedrich von der Schulenburg, was an army officer and her mother, Freda-Marie, nee von Arnim, came from another of Prussia’s old families. This background makes the choices Tisa made and the causes she championed even more remarkable, and her life is a cautionary tale about judging people. Elisabeth was the fifth child of the family and the only daughter. She became known affectionately as Tisa. The family had close ties to England, where her father had been posted as military attaché from 1902-1906. Although the family moved around frequently with various military postings, home was considered to be a castle within estates in Mecklenburg, northern Germany. The Great War had a profound effect on the family; Tisa’s father was appointed Chief of Staff to the Crown Prince and was involved with the key players at the highest level. The elder brothers saw action whilst still teenagers and returned home physically and emotionally scarred. By the end of the war the German Empire had collapsed, the monarchy had ended and power had effectively been transferred from the nobility to the bourgeois. For a family such as the von Schulenburgs, this hit very hard. Tisa Schulenburg had to some extent been protected from the outside world in her childhood, and her education had at first been through private tutors. As she grew up she started to break loose from the confines of her family; she attended boarding school on the Baltic coast, then spent a miserable year at home attempting to learn household management. What she wanted to be was an artist, but it was some time before her parents relented and she was allowed to attend the Berlin Art Academy. She studied sculpture under Fritz Klimsch and soon immersed herself in the whirligig of artistic, intellectual and social life of 1920s Berlin, where she became acquainted with such people as Thomas and Heinrich Mann, Bertolt Brecht and Oskar Kokoschka. In 1928 she married a Jewish businessman Fritz Hess, a match that caused huge consternation with her family, not only on account of his being Jewish, but also a divorce and twenty years her senior. When Hitler’s attained power in 1933 the freedoms and energy of the Berlin artistic world collapsed and Tisa left Germany, together with Fritz and many of their friends. She went to London in a move that signified a split with her family, as her father and four of her five brothers supported the Nazis. As Mr. and Mrs. Hess Tisa and her husband lived in Highgate, and moved in a circle that included the architect Ernst Freud, the father of Lucian and Clement. Tisa also struck up a friendship with Henry Moore and joined the anti-fascist Artists’ International Association. A chance encounter at the coast with a lady from Durham led to an invitation to give art lessons and talks to unemployed miners at Durham. Tisa obliged and later described that she considered she had found both a home and a job. This aristocratic German lady became an unlikely friend and champion of the gritty northern miners, and they developed a mutual admiration. Towards the end of the 1930s her marriage to Fritz broke down and they divorced in 1938. Later that year news reached her in Britain that her father was gravely ill and she returned home. Her father died in 1939 and Hitler attended the funeral. The British press obtained photographs of Hitler with members of the family, and when Tisa tried to return to England she was stopped by immigration officials at Croydon airport and prevented from entering the country. To the Nazis she was a socialist. To the British she was the daughter of a Nazi. She felt trapped and was obliged to spend the Second World War in Germany. She returned to Mecklenburg and in 1939 married a neighbor and former flame, Carl Ullrich von Barner. The story of Tisa’s fifth and favourite brother, Fritz-Dietlof, is remarkable in itself. Despite the political views of his father and brothers he turned his back on Nazism and worked with the Resistance. He was among the group of plotters who were intent on assassinating Hitler. The plot failed when on July 20 1944 a bomb planted by Colonel Claus Schnk von Stauffenburg – who had met with Fritz-Dietlof at Tis’a home – failed to kill Hitler. Fritz-Dietlof was among the first to be rounded up, and was later hanged as a traitor. Thus, by the end of the Second World War Tisa’s circumstances were extremely bleak. All of her family’s lands – which now fell in the Soviet zone of Germany – were expropriated, both her patents had died, her favourite brother had been executed and her other four brothers were also dead. It was a bleak and lonely time, and was followed, perhaps inevitably, by her divorce from Barner in 1946. Tisa worked for a while as a journalist and then for the British Army, before finding spiritual contentment as a convert to Roman Catholicism. In 1950 she entered the Ursuline convent at Dorsten, in the Ruhr, and took the name Sister Paula. She again struck up close ties with the local mining community and when the miners at Dorsten held a vigil in 1997 to protest about the proposed closure of the mine she joined in, at the coal face, and was a constant companion of and champion for the miners, even meeting with the Prime Minister on their behalf. Tisa combined her religious life with practicality, raising money to support her convent by selling her pictures. She also founded a Jewish museum, one of the first in Germany. Over the decades she became something of a local personality. She was made an honorary citizen of Dorsten, the first time that the award had been given to a woman. In 1994 she received the Federal Cross of Merit for lifetime achievement and for her strong social commitment – this was presented by the then Federal Minister for Women and Youth, one Angela Merkel. So far as her religious life allowed, she also returned often to England, staying with a niece in north Wales. Tisa had no children of her own, but was a much-loved aunt to several generations of nieces and nephews. Well into her nineties she retained her wit and unstuffy lightheartedness, and wonderment at life’s mysteries, among them the family bond. She died in Dorsten in 2001, aged 97. It has been said that Countess von der Schulenburg’s life became a metaphor for the post-war era-“They saw in her someone who had a deep understanding of what had happened in Germany, who represented the new Germany but came out of the old one, and who had managed through her independence and sense of freedom to make something good of herself”. Tisa saw human nature in all its complexities. She loved her family and was loyal to it, despite very real ideological differences, and the fact that the family denounced her brother Fritz as a traitor. She was tolerant and saw from the family’s failures that without forgiveness you make yourself blind. As an artist, Tisa demonstrated endless charisma and empathy; she was liberated, uncompromising and fearless and used her skills to a greater social good. Her sculpture and drawings reflect her experience and knowledge of the darker moments of the 20th century, with human suffering and hardship as a constant theme. She was one of the first German artists to recognise the plight of the Jews during the Third Reich and some of her most powerful work concerned the Holocaust, the horrors of which she addressed in a series of harrowing prints and bronze reliefs. She also sketched the refugees of Europe after the war, as well as the commemorating the sacrifices of the miners. It has been said that her drawings of miners turned them into demigods, and those of Jews turned ink stains into tears. Throughout her long life Tisa continued to draw the attention of the world to areas of suffering and oppression. She drew the civilians of Vietnam in the sixties, in an attempt to shock the security of those in the west and highlight the horrors of that Far Eastern theatre of carnage. She considered this war as particularly cruel in its inequality of arms, and the mass suffering of ordinary people. She has also completed works relating to conflict and social conditions in Africa and the Middle East, the starving in Biafra and Ethiopia, events in Chile, and social inequality in third world countries. Although towards the end of her life a vibrancy of colour appeared in her work, she was never able to leave the oppressed, the persecuted or the suffering and her images today serve as a reminder to us that we must not forget the consequences of what we do to each other. 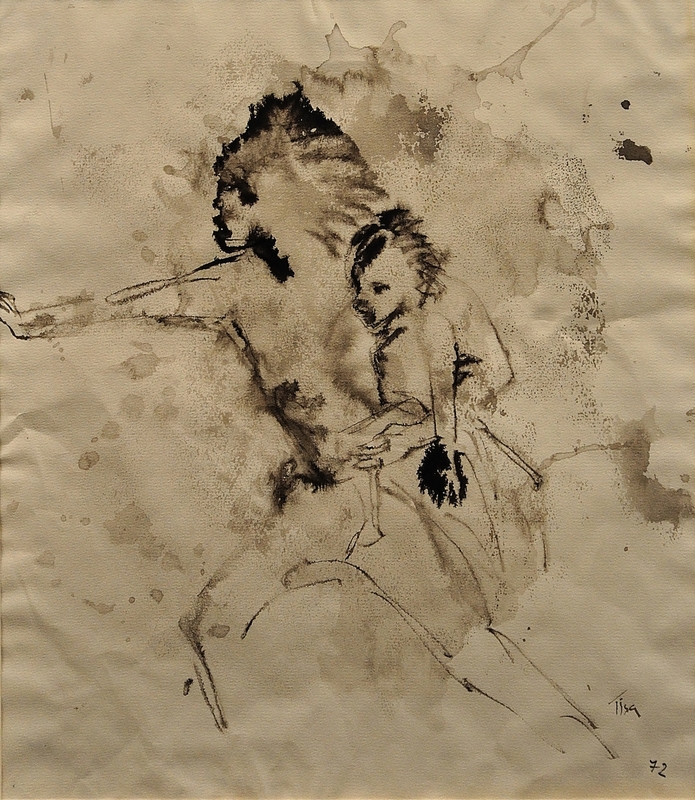 This extraordinary original work in ink and wash depicts two figures, a mother and child in a moment of panic and desperation. The mother hugs the young child to her hip with one arm. Her other arm is flung out as if leading the way or pushing through in an act of defiance. It is a strong pose, yet full of tenderness and human frailty. The madness of the situation is captured and reduced to its very basics – a fight for survival. There is very little detail in this artwork, but there is enough to tell us all we need to know. It speaks straight to the heart about the horror of war and its effects on people, with the bond between mother and child being preserved until the last.